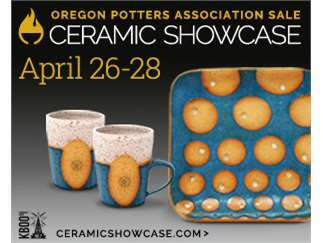 The 37th annual Ceramic Showcase, one of the largest all clay shows, will have more than 150 Oregon Potters Association members showing and selling their work which will include sculptures, wall art, and functional pottery for the home, garden and work and well as beautiful gifts for Mother's Day, weddings, birthdays, housewarmings and other celebrations. Attendees will have the opportunity to meet the artists. A children’s clay play area will be set up for children to make something in clay with guidance from professional potters. Our members will also be giving demonstrations. A special gallery will be set up where one of a kind artwork in clay will be for sale. One area will be devoted to local high school students vying for a $1000. scholarship. Each year, OPA members donate work to sell with proceeds going to charity. This year’s theme is pet bowls with sales going to the Oregon Humane Society and to fund the OPA clay in education fund. 5 $50 gift certificates will be given out. 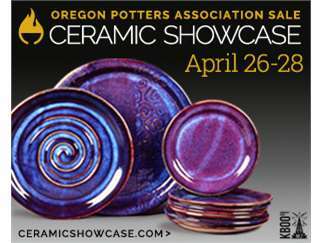 The show runs from April 26-28th at the Oregon Convention Center in conjunction with Gathering of the Guilds. Admission is free with a suggested $3 donation. 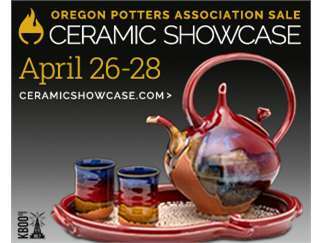 Go to www.ceramicshowcase.com for exact hours and photos of potters work.The 37th annual Ceramic Showcase, one of the largest all clay shows, will have more than 150 Oregon Potters Association members showing and selling their work which will include sculptures, wall art, and functional pottery for the home, garden and work and well as beautiful gifts for Mother's Day, weddings, birthdays, housewarmings and other celebrations. Attendees will have the opportunity to meet the artists. A children’s clay play area will be set up for children to make something in clay with guidance from professional potters. Our members will also be giving demonstrations. A special gallery will be set up where one of a kind artwork in clay will be for sale. One area will be devoted to local high school students vying for a $1000. scholarship. Each year, OPA members donate work to sell with proceeds going to charity. This year’s theme is pet bowls with sales going to the Oregon Humane Society and to fund the OPA clay in education fund. 5 $50 gift certificates will be given out. 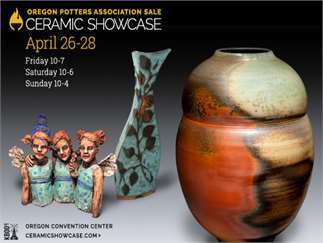 The show runs from April 26-28th at the Oregon Convention Center in conjunction with Gathering of the Guilds. Admission is free with a suggested $3 donation. Go to www.ceramicshowcase.com for exact hours and photos of potters work. Oregon Ball Room 777 N.E. MLK Jr. Blvd.